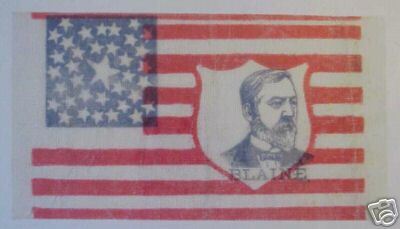 From the book "Flags to Color, Washington to Lincoln," and is on page 23. 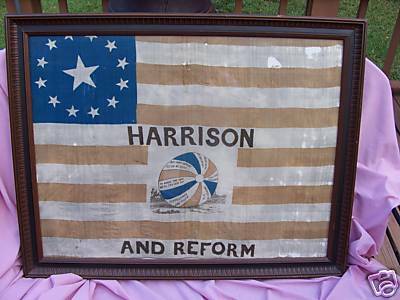 It's listed as "William Henry Harrison election flag, 1840." "Colors: White stars on blue; 9 red and 7 [sic: 8] white stripes; black lettering; wreath ribbon and coat red." 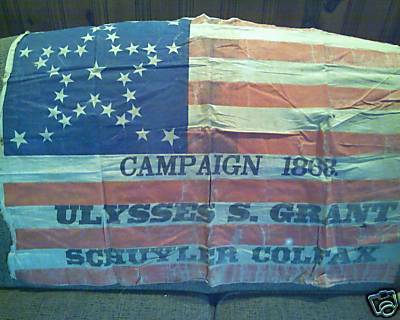 "It was common practice during the nineteenth century for candidates to political office to show their patriotism by displaying banners composed of the Stars and Stripes and their own portraits and slogans. It was not seen as desecration or disrespect and indeed the flag found its way into many items of home decoration, architecture, art and utilitarian objects. Eventually attitudes changed and the Flag Code as well as state laws eliminated the use of inscriptions and portraits on the national flag. In the process Old Glory became the object of a virtual religion of patriotism unknown in other countries." Dimensions: Approx. 21" High, 28.5" Wide Unframed. 13 Stars arranged in circle including 1 star in center. Hand painted on silk, 6 red stripes, 6 white stripes. This flag shows a circular ball in it. The 'significance' of this ball is that back in the 1830s during political campaigns, supporters of a candidate would make large wooden or cloth balls (6-8 feet in height) and roll them between communities to display and thereby advertize the campaign slogans of a candidate." This flag apparently had some lettering in the form of a long sentence or sentences written vertically in black, taking up three lines through the red & white stripes, just in the middle area from the canton to the fly edge. 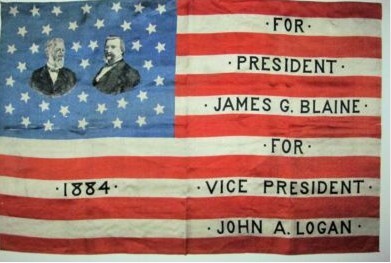 Douglas was reelected in 1858 while running against Lincoln.